Teleperfomance is a company that specializes in handling customer service for a variety of different companies and they need people who are willing to help them out. While I have not personally worked for Teleperformance, I have spoken to people who have and all things considered, they have the experience to be fairly positive. One of the first things everyone I spoke to mentioned was that all the people they worked for were wonderful and that Teleperfomance did a great job of creating a comfortable, work at home environment. Applying to work at Teleperformance is surprising easily and can be done entirely online. All you have to do is answer each of the questions posed to you. 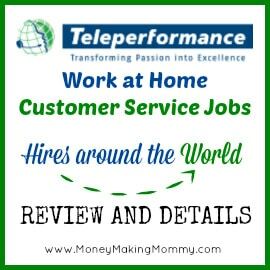 If the Teleperformance team likes you application and can find a place for you, they’ll welcome you to the team and start your training program for their work at home customer service jobs. Many of the people I spoke to while gathering information about Teleperformance weren’t as positive about the training program as I would have liked. Most reported that while the training program does cover the basics, it really didn’t prepare them for the situations they encountered once they started working with customers. One person said that the training program wasn’t sufficient enough to prepare them for a surprise performance test and that the low score they received on this test was the reason the company provided for letting them go. While I was unable to find out exactly how Teleperformance handles the pay scale, the people I spoke to were quick to point out that the company was very good about paying in a timely fashion. They were equally quick to point out that when they sat down and worked out the numbers, the amount of money they were paid came out to about the same amount as the national minimum wage, which really isn’t enough for anyone to actually live on. Based on the data I’ve been able to put together, I’m comfortable saying that Teleperformance is a legit work opportunity. One of the things I really liked about this company was that it was willing to work with contractors from all over the world, instead of limiting itself to a very small pool of workers from select countries. But considering how little they pay, it shouldn’t be your main nest egg, though I do think it might be a great place to start out if you’re interested in gaining insight to work at home customer service jobs and experience which would then make you eligible to apply for work at similar companies that have a higher pay scale.